"This is my family's favorite Christmas dinner. Elegant for dinner parties or a romantic dinner for two. If you desire crabmeat instead of lobster, go for it!" Set oven to Broil at 500 degrees F (260 degrees C). Sprinkle tenderloins all over with salt, pepper, and garlic powder. Wrap each filet with bacon, and secure with a toothpick. Place on a broiling pan, and broil to desired doneness, about 8 to 10 minutes per side for medium rare. While tenderloins are cooking, melt 1/4 cup of butter over medium heat with 1/2 teaspoon Old Bay(R) seasoning. Stir in chopped lobster meat, and cook until done. 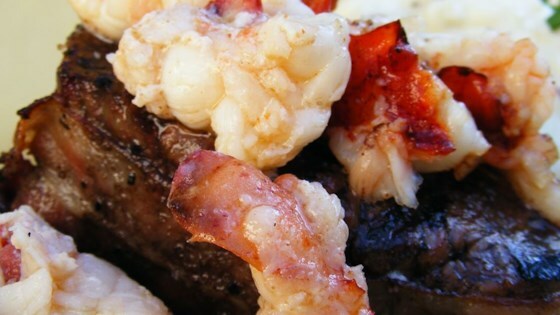 Spoon lobster meat over cooked tenderloins, and return them to the broiler until the lobster meat begins to brown. While the lobster is in the oven, heat the remaining 1/4 cup of butter in a small saucepan over medium-high heat, cook until it browns, turning the color of a hazelnut. To serve, spoon the browned butter over the steaks, and sprinkle with the remaining Old Bay(R) seasoning. See how simple it is to get perfect, succulent steamed lobster. I used no seasoning to the lobster and just sautéed it in butter then added to the filet. No need to cover the taste of Maine lobster with seasoning. Other then that great recipe.